The decision to leave Russian fleet in Crimea till 2042 opens the way for its large-scale modernization. French helicopter carrier Mistral planned to be purchased by Russia this year could be the first change in obsolete hardware, informs Delo. Reportedly, the agreement between Russian and Ukrainian presidents about prolongation of Black Sea Fleet's (BSF) deployment in Crimea till 2042 leads to inevitable renewal. Even today about 20 BSF ships including the flagship – missile cruise Moskva – have left behind a 30-year term which is service limit of surface ships. Through years the Russians had unsuccessfully attempted to rotate military hardware in Crimea waters. Even a year before that was inconceivable, since Ukrainian party declined BSF modernization referring to interstate agreements of 1997. Those agreements plainly defined what ships could be deployed at Ukrainian territory. However, lease extension of the naval base till 2042 makes no sense without renovation of the fleet's structure. After signing interstate agreements of lease prolongation on April 22, Russian party even voiced concrete plans to replace its ships at the Black Sea Fleet. One of the main novelties could be a French Mistral-type helicopter carrier flying Russian naval flag at Sevastopol moorage wall. Russian defense ministry plans to sign a procurement contract as for the French carrier by the end of 2010. Russian and French leaders pre-engaged about purchase of four such ships; each costs somewhat 400-500 mln euro. The only unresolved issue is how many ships would be built in France, thus – how many would be built under license in Russia. Igor Korotchenko, member of social council at Russian Ministry of Defense has recently made a forecast that one of these vessels would be registered in Crimea. "It is not improbable that the first Mistral-type carrier built in France for Russia would be based in Sevastopol and undertake the functions of command ship", he said. "Construction of such vessels could be arranged at Nikolayev shipyards, where all Soviet carriers had been built", added Anatoly Tsyganok, director of Russian Military Forecasting Center. By the way, combat capability of the carrier was oratorically appraised by Vladimir Vysotsky, Russian Navy Commander-in-Chief last year: "Had we possessed Mistral-type ship during the conflict with Georgia, Black Sea Fleet would accomplish its mission in 40 minutes, but not in 26 hours". Ukraine itself can also contribute to renewal of Russian Black Sea Fleet. According to Mikhail Nenashev, Russian MP and chairman of military technical cooperation committee, Ukrainian missile cruiser Ukraina being laid up at Nikolayev shipyard 70% completed could be commissioned into Russian Navy. "We do need this ship", the MP said. Nenashev also affirmed that prolongation of BSF deployment in Crimea "opens the way for actual agreements in the cruiser procurement issue". Additionally, the member of Russian parliament informed that there was a floating workshop almost 100% completed at Kherson shipyard; Russia needs such maintenance ship for reloading nuclear rectors. "We're ready to buy this workshop either for the Navy or for naval transport fleet". 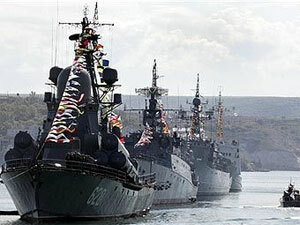 Generally, Black Sea Fleet will definitely face a large-scale renovation, say Russian experts. "The fleet will obtain up to 8 Stereguschiy class corvettes and Admiral Gorshkov class frigates, 10-12 Aleksandrit class minesweepers, 6-8 Buyan class small gunnery ships, 10-12 Scorpion class missile boats, and also 8-10 P-750 type midget submarines", explained Korotchenko. It is pertinent to recall last year's statement of Navy Commander Vladimir Vysotsky that beginning from 2010 Black Sea Fleet would annually receive one ocean-going surface ship and one submarine. Ukrainian experts agree that if Russian BSF stays in Crimea till 2042 ship rotation would be inevitable. "Extension of BSF deployment term automatically implies its modernization. It was previously said that till 2017 the ships could get rusty, and now their presence till 2042 without upgrade is impossible at all", explains Capt 1 rank of Ukrainian Navy Miroslav Mamchak. In contrast to Russia's colossal plans, Ukrainian Navy would be unlikely renewed in the foreseeable future. Defense minister Admiral Mikhail Ezhel stated recently that only 25% of Ukrainian warships are in serviceable conditions. In the period of 2006-2009 the ministry had not received about 11.5 bln grivnas [national currency] which were assigned for development of armed forces. BSF naval base accommodates 22 Su-24 type aircrafts capable to carry nuclear munitions. 18 of them are bombers, the rest 4 are Su-24MR recon aircrafts. BSF has also at least 10 in-service helicopters Ka-25, Ka-27, Mi-14 and Mi-8. At present, BSF naval base includes 4, 591 facilities of naval infrastructure.